While Ward Kimball was a brilliant draftsman, he preferred to work on comical characters rather than realistic human designs. Animating came easily to him and he was constantly looking to do things differently. Because of this, Walt Disney called Ward a genius in the book The Story of Walt Disney. While there were many talented animators at Disney, Ward’s efforts stand out as unique. According to Jeff Lenburg’s assessment of him, Kimball was a pioneer animator and a great innovator of his time. His work had been honored with the Academy Award for Best Animated Short Film. He served as one of Disney’s Nine Old Men. He instilled life to diverse Disney characters, such as Mickey Mouse, Jiminy Cricket, the Cheshire Cat, the Mad Hatter, and Tweedledee and Tweedledum. 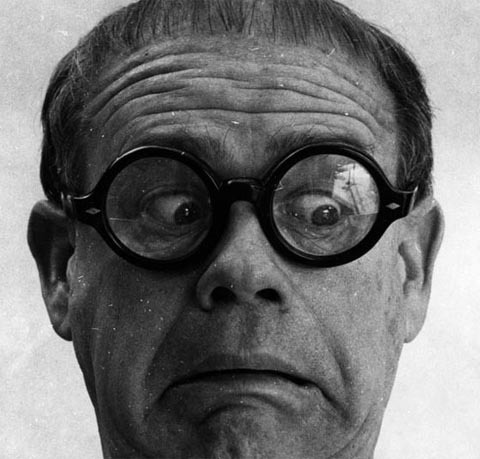 Ward Kimball attended the Santa Barbara School of the Arts in order to become a painter and illustrator. Kimball’s instructor at the school suggested to him that his work should be submitted to Walt Disney Productions (later known as the Walt Disney Animation Studios), and that he should pursue a career in animation. In March 1934, a 20-year-old Kimball applied for a job at the Disney studio. In April 1934, he was hired as an inbetweener. He was then promoted to an assistant animator. He served as an assistant to animator Hamilton Luske. Kimball worked primarily in the Silly Symphony series, where his film credits include the animated short films The Wise Little Hen (1934), The Goddess of Spring (1934), and The Tortoise and the Hare (1935). He also worked on the Mickey Mouse series, where his film credits include the short film Orphan’s Benefit (1934). 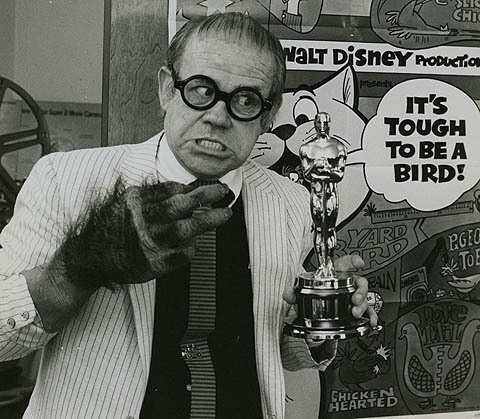 In 1936, Ward Kimball was promoted to an animator in his own right. He continued to work in the Silly Symphony series. Some of his memorable credits in this position include the animated short films Toby Tortoise Returns (1936), More Kittens (1936), and Mother Goose Goes Hollywood (1938). His first solo effort as an animator was animating a grasshopper turned musician in Woodland Café (1937). Kimball was included in the team of animators known later as Disney’s Nine Old Men, whose original task was animating Snow White and the Seven Dwarfs (1937). The film was the first full-length animated feature film by the Disney studio. Kimball spend months working on the sequence animation for a scene where the Seven Dwarfs are eating soup, prepared for them by Snow White. Following the release of Snow White, Kimball was promoted to a supervising or directing animator. He would remain in this position until his retirement in the 1970s. His employer Walt Disney was sufficiently satisfied with Kimball’s work that he entrusted him with designing new character Jiminy Cricket. The character was intended for use in the Disney studio’s next feature film, Pinocchio. It took Kimball 12 or 14 drafts before completing his final design of Jiminy. Kimball told one interviewer that he “hated” animating Jiminy Cricket: “I got sick of drawing that oval head looking in every direction.”) Kimball’s next major task was designing the sympathetic Crows in Dumbo (1941). Following the example of the Seven Dwarfs from Snow White, Kimball had to give each crow a distinct appearance and character. 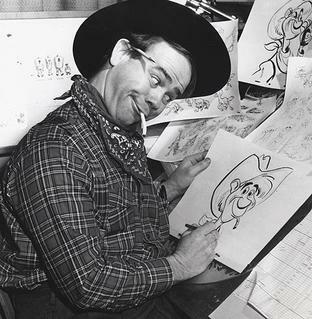 Ward Kimball supervised or directed the animation of several Disney animated feature films. Among them were Fantasia (1940), The Reluctant Dragon (1941), and The Three Caballeros (1944). The last film mentioned featured the trio of Donald Duck, José Carioca, and Panchito Pistoles. According to animation historian Jeff Lenburg, The Three Caballeros is considered to have a place among the finest work of Kimball’s career. The film was reportedly successful in the American box office, earning about 3 to 4 million dollars. Kimball directed the character animation and sequences of the Pecos Bill segment in Melody Time (1948). 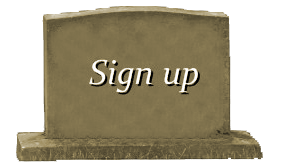 He also worked as a senior animator for The Adventures of Ichabod and Mr. Toad (1949). In Cinderella (1950), Kimball was responsible for the characters Jaq and Gus and Lucifer the Cat. In Alice in Wonderland (1951), Kimball was responsible for Tweedledee and Tweedledum, the Walrus and the Carpenter, the Hatter and his mad tea party, and the Cheshire Cat. His other film credits include the feature films Peter Pan (1953), Mary Poppins (1964), and Bedknobs and Broomsticks (1971). Kimball spend much of his career animating theatrical animated short films. However, he also served as a director for some of them. He and Charles August Nichols co-directed the animated short films Melody (1953) and Toot, Whistle, Plunk and Boom (1953). Melody was the Disney studio’s first animated 3D film. Toot, Whistle, Plunk and Boom won the Academy Award for Best Animated Short Film. It was the Disney studio’s first widescreen CinemaScope animated film. Kimball also directed the short films It’s Tough to Be a Bird (1969) and Dad, Can I Borrow the Car? (1970). It’s Tough to Be a Bird won the Academy Award for Best Animated Short Film. Ward Kimball served as a screenwriter for the featurette Eyes In Outer Space (1959). The film combined live action and animation. It depicted weather satellites and explained how the weather is predicted. The film was originally theatrically released. Around 1962, it started being shown in Disneyland. During the 1950s, the Disney studio shifted its focus from theatrical animation to television. Kimball wrote and directed three hour-long television shows about space exploration. They were Man in Space (1955), Man and the Moon (1955), and Mars and Beyond (1957). The consultants for these shows included pioneers of the Space Age, such as aerospace engineer Wernher von Braun. According to animation historian Jeff Lenburg, the three shows helped in sparking popular interest in spaceflight. Kimball was also responsible for the science-fiction two-reel cartoon Cosmic Capers (1957). Kimball also worked (as a writer) on the live-action film Babes in Toyland (1961), a musical film. He later returned to television and directed 43 episodes of The Mouse Factory (1972-1973). According to Jeff Lenburg, Kimball retired in 1973 and left the Disney studio. 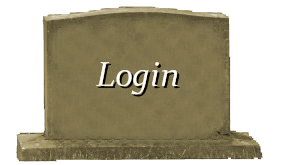 He continued, however, to serve as a consultant on special assignments. He worked on the World of Motion attraction for Disney’s EPCOT Center.